Weight lifting for the elderly (or anyone else) is a great way to get your health back on track. In fact, it is one of the oldest forms of exercise. It is never too late to get stronger and improve your overall health and wellbeing. Frailty and weakness can easily be corrected with exercise and consistent strength training. Strength training is also beneficial for sufferers of osteoarthritis and osteoporosis. Exercises reduces joint loading by improving muscle strength and joint integrity. Make a booking with us today and see how we can help you. As we age, our ability to move freely can easily diminish due to pain, stiffness, health problems, or due to a specific injury. Aged care Physiotherapy is a specialized field in which experienced Physiotherapists devote their time. Evidence suggests that if you continue to exercise regularly to keep physically fit, you are subsequently increasing your chances of living a healthier life. Aged care Physiotherapy encourage people to stay active and can customise exercises for people based on age and physical condition. Physiotherapists working in Aged care are skilled in creating personalised exercise programs for seniors. Physiotherapists can help those who are limited due to arthritis, stroke, a fracture, osteoporosis, and heart disease or even healthy people who just want improve their exercise routine and muscle movement. In some areas, physiotherapists run special fitness classes for seniors. 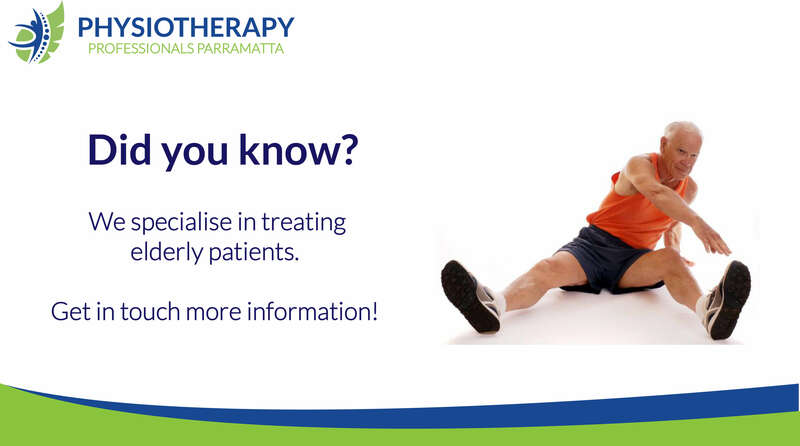 Speak to Physiotherapy Professionals Parramatta and see how we can help you.